whose brutal winds strip bare her trees. to chase the sun, now fallen stars. to sullen pleasures of the spring? of earth in sweet fertility. to breathe in blossoms of May air. Mike Orlock is a retired high school English and American History teacher who splits time between the Chicago suburbs and a vacation home in Sturgeon Bay, Wisconsin. 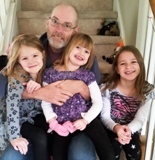 He has been married for 43 years to his high school sweetheart and inspiration, Liz, and greatly enjoys being grandfather to five beautiful granddaughters who keep him "jumping like a frog on a hot skillet." Mike's short stories, poems, and reviews have appeared in a variety of publications and he was a Jade Ring winner in a contest sponsored by the Wisconsin Writers Association. Great job of capturing November. I love "blossoms of May air"! Why does your opening line sound so familiar? An eloquent poem. I especially enjoyed the simile in the second stanza. My, I loved this poem immensely. It has such meaning in a pleasing manner of rhyme. Thank you. There are days in the summer, abundant with humidity, deer flies and mosquitos that I almost wish for a little taste of November as this poem describes. Almost. you are right on with that thought Mike. NH in November is dished out with rain, snow, slush, icy roads, gusts of 30 mph NW winds and cold, cold temps.